The sixth FIFA World Cup was played in Sweden 8-29 June. It had been 51 teams who tried to qualify from three regions: Latin America, Europe and Great Britain and 16 would be entering the final tournament hold in Sweden. In all previous World Cup it had always been some nations that didn't want or wasn't able to partake. 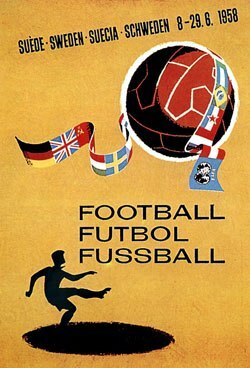 In the 1958 edition all countries in the world all football was involved in the qualifications that would lead to the final tournament in Sweden. And for the first time in World Cup history, all the British nations would be qualified. The decision of letting a European country be the host for the World Cup twice in a row would upset the South Americans. It had also happened 1934-1938, but from FIFA it was decided that the tournament from now on would change continent every four years. The decision to let a relatively small country as Sweden with less than 7 million people be the host for a World Cup would also be criticized concerning the potential for big audiences. The average attendance would also be relatively low, some thousands less than in Switzerland 1954, but actually higher than in France 1938 (which also was before television). The format consisted of a first phase with four four-teams group and from each two teams would advance to a final knockout stage including eight teams. The knockout stage consisted of quarter-finals, semi-finals, a third place match and a final. The matches would be played in twelve cities in Sweden and at twelve stadiums (see “Cities and stadiums” box for overview). The final would be played at the Råsunda Stadium in the capital city, Stockholm. Among the participants was the reigning championship West Germany, whereas another former champion team Uruguay didn’t make it through the qualification. The era of the former South American super power seemed to be over, Uruguay would never again come close to its previous results. Hungary who had dominated the European football for a long time would be cut short due to the Hungarian revolution which forced many players to leave the country. The new, unproven Hungarian team wouldn’t make it through the group phase, instead the big surprise team Wales would take the second place in the group along with Sweden to the next stage. A new star would be born in the 1958 World Cup. After a bleak draw in their premier match against England two new players would be given the chance in the Brazilian team in the next match: Garrincha and Pelé. Brazil would reach the all the way and the 17 old Péle would be the youngest ever in a World Cup final. 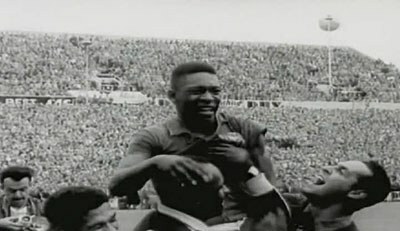 Not only was he the youngest, he did also one of the most memorable goals ever in the World Cup in the final against Sweden … A high ball into the penalty box, Pelé jumps and stop it with his breast in front of a defender, the next defender are approaching but Pelé show his already granted genius by effortless lob the ball over and then by a volley shot it into the goal. Pelé lures the Swedish defenders with brilliancy and preparing for a volley. Pelé was not the only one making history. Just Fontaine made 13 goals for France and this is today an unbeaten record in the World Cup. The FIFA 1958 World Cup would also get some attention for rough and unfair manners on the field. Oddly enough substitutions were still not allowed and an injury would lead to a missing player for the team. FIFA World Cup 1958 would include 35 matches in which 126 goals were made. The 3,6 goals per match were lower than in all previous World Cup editions and the tournament in Sweden would also include the first 0-0 match, played between Brazil and England, in the history of the World Cup (qualification round excluded). 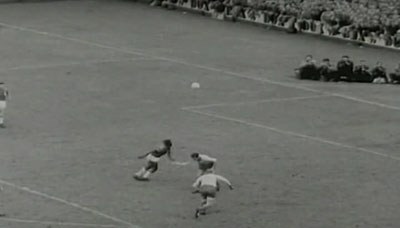 When Pelé scored against Wales he became the youngest goal scorer (17 years and 239 days) in the history of the tournament. West Germany, Northern Ireland, France, Yugoslavia, Sweden, Wales, Brazil and Soviet would advance to the knockout stage. The final would see the home team Sweden unable to resist the Brazilians. The final score 5-2 would be a goal record in a World Cup final (the former record was six goals in the 1930 final). Pelé with tears of happiness.